Royal College of Art graduate Gaspard Tiné-Berès has designed slippers made from just one piece of felt and a shoelace (+ movie). 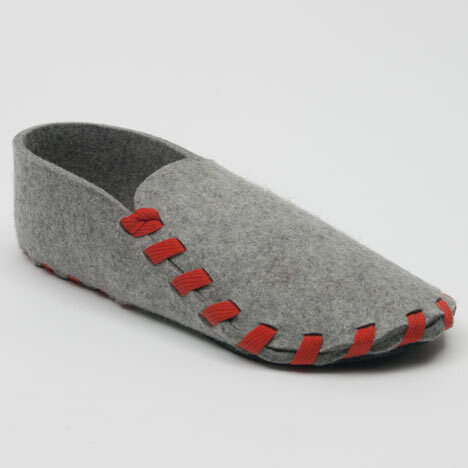 The slippers are delivered flat-packed and come with coloured laces that the user has to thread along the seam, which curls around the edge of the sole and over one side of the upper. Tiné-Berès graduated from the college's Design Products course and his work is on display at Show RCA, which continues until 1 July. We have also featured an eye-tracking camera and jars made of radioactive earth from this year's show - read all our stories from the show here. These slippers are constructed from a single piece of natural wool felt, their 3D form being created by complex 2D geometry of the pattern. The shapes are die-cut from sheets of 5mm thick felt with minimal, simple and affordable tooling - making this product very suitable for small-scale local production. The slippers are delivered flat-packed for assembly by the user by "sewing" the seams with the standard laces supplied in a colour of their choice. The act of self-assembling the slippers increases the sense of ownership and emotional connection with them and allows for personalisation through the choice of laces used. House and Gardens Scholarship helped my to invest in the die-cutting tools in order to produce a range in ten standard sizes that I will be selling directly via a dedicated website opening next september.